You are browsing the archive for 2008 December. Some years ago I received a letter from the USA, from a lad of 14, who loved cartoons. He said he admired my cartoons (sic) and that he would dearly love to be a cartoonist, but that seemed an impossible dream, so might I oblige him with a small drawing, or signature, so he could compile a book of his heroes. I duly obliged and despatched a small signed self-caricature. A couple of years later, and another letter arrived, from this same boy – who had remained miraculously 14 – with the same request. I ignored this one, and thought no more about it until, a while later, a package arrived containing 100 sheets of C5 blank paper, and a note stating that as I was obviously too busy, could I please pass round the sheets among my fellow cartoonists for them to do a drawing and/or signature for the book of cartoon heroes. At this point I contacted cartoonist Mell Lazarus in the USA and asked him if he had ever heard of this boy. I could almost hear the acid laughter floating upon the water between us, when he replied that the ‘boy’ was well-known to American cartoonists, and in fact was a middle-aged lawyer who made quite a living, buying and selling original sketches and signatures at specialist auctions held all over the States. The Americans had given this guy the bum’s rush, and he guessed that now it was our turn. There was a son but he had grown up. The exact origins of Father Christmas (as opposed to Santa Claus) are lost in time: he was probably a pagan personification of midwinter, who put in an appearance around the solstice on December 21st. 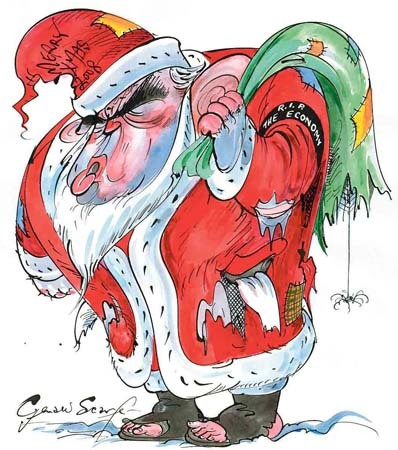 Indeed, he may well have been one and the same person as the old bearded man with the scythe and hour-glass, Father Time, who turns up at New Year, a week or so after Christmas is over (and once he’s slept off the sherry and mince pies). Father Christmas was a central character in Britain’s seasonal festivities long before Santa Claus joined in the celebrations. Santa didn’t really participate in the fun until the nineteenth century. However, once Santa put in an appearance he soon pushed the original Father Christmas into the background. Why? Because Santa was an American. Or, to be more precise, an American descendant of Turkish ancestry. The original Santa Claus was Nicholas, a 4th century bishop of Myra in Turkey, who reputedly handed out gifts to children. (Very suspicious, if he were around nowadays there’d be a heavy police file and, possibly, an electronic tag around his ankle.) The bishop remained relatively obscure for fifteen hundred years or more until his star suddenly rose in the nineteenth century. St Nicholas entered popular culture in the United States when, in 1809, the novelist Washington Irving (who wrote Rip Van Winkle) penned a satire on the Dutch culture of New York (a city that had a strong Dutch element in its history – so much so that it was originally called New Amsterdam). In his satire he referred to Saint Nicholas by his Dutch name of Santa Claus and portrayed him somewhat like an elfin Dutch burgher with a clay pipe. A few years later, 1822, Dr. Clement Clarke Moore, a professor at a theology college in New York and the son of the Bishop of New York and his heiress wife (the family were so rich that the college at which Moore taught was built on their own estate), read Irving’s book and published a poem based on the Santa Claus character: “Twas the night before Christmas, when all through the house, not a creature was stirring, not even a mouse.” The poem became a great hit: you may be familiar with it yourself (or at least with its opening lines). It was in this poem that Santa first acquired his reindeer. Before this he had to make do, somewhat bizarrely, with an eight-legged flying horse. At this point the Santa industry went stratospheric. With the poem as inspiration, the cartoonist Thomas Nast started to draw the first of what would eventually be more than two thousand illustrations for Harper’s Weekly magazine depicting Santa. Nast’s early depictions of Santa showed a rotund gent of quite serious demeanor, becoming more jovial over the passing years. This Santa was closer to Washington Irving’s version than the usual stern bishop of previous tradition. Nast also gave Santa his headquarters at the North Pole and his army of toiling elves. Judging by this illustration you may think that Santa’s wearing a rather festive outfit, festooned with Christmas stars – however, if you look at the original drawing you’ll see that he’s sitting beneath a Union flag. The suit – with its starry jacket and striped trousers – represents this flag. If the illustration had been in colour the jacket would have been blue (I bet you assumed that it was red), reflecting the colour of the ground behind the stars on the flag, while the trousers would be red and white stripes. Nast was essentially a political cartoonist – and in political cartoons wrapping a character in a flag to signify their allegiance is quite common. At the time that Nast created the illustration the American civil war was in progress. Nast was on the Unionist side. The puppet in Santa’s hand bears an uncanny resemblance to Jefferson Davis, the president of the Confederate states of America whom the Unionists, or Federal states, were fighting. It was essentially Nast’s imagination that gave us the Santa that we know today – except, that is, for his red coat with white trim. Santa reputedly wears a red and white outfit because they are the corporate colours of the Coca Cola Corporation, who enlisted Santa to promote their fizzy drink in the 1930s. The Coke ads were created by an American commercial artist of Swedish ancestry, Haddon Sundblom , who modelled his Santa on his friend Lou Prentice, chosen for his cheerfully rotund features. So it is that Santa Claus doesn’t actually come from the North Pole but from New York city, and he doesn’t date from the birth of Christianity two thousand years ago but from the early days of capitalism in the mid-nineteenth century. 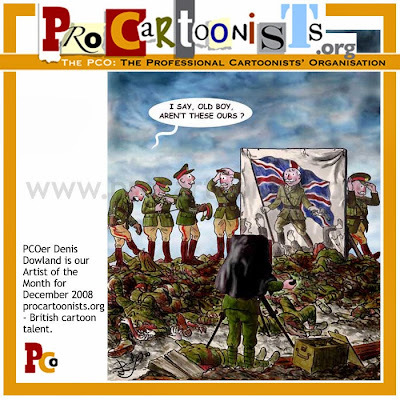 PCO Artist of the Month Denis Dowland, tells Bloghorn about some of his cartoon influences: “A good gag’s a good gag so I am not so particular about graphic styles. I think the great majority of cartoonists, and I don’t even mind being counted as one of them, come up with at most a handful of works that will stand the test of (short to medium) time. Back in November we blogged about the PCO’s team for Transports of Delight – a cartoon banner competition held at St Pancras rail station in London as part of the The Big Draw. Well, now you can own a piece of cartooning history as the four banners in the competition (from The Guardian, The Independent, Private Eye and the PCO) are being auctioned off on eBay, with all proceeds going to the Campaign for Drawing, a charity whose purpose is to promote drawing as a tool to support learning, and cultural and social engagement for all ages and abilities. Hurry though, if you do want to make a bid, as the auctions end on the evening of Monday 22nd December! 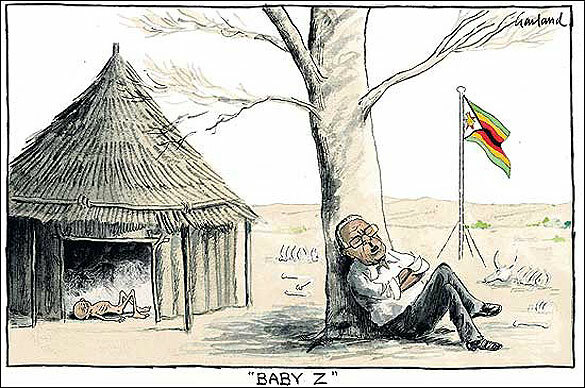 Spotted by PCOer Morten Morland and with a handy translation. “The Case of the Haunted Piecrust”, “Wocko the Beaut”, “Supa-Dupa Man”, “Speed Umplestoop” and “Tripalong Hoppity” – all of these and many more funnies fell out of the wonderfully zany mind of cartoonist Emile Mercier. Mercier was born in New Caledonia in 1901. Twenty years later, in Australia, he began his career as a freelance cartoonist. During the Second World War, the bulk of his work, the comics, appeared in an array of Frank Johnson Publications. Johnson encouraged Australian talents and his publications developed a character and liveliness which set them apart – sometimes for the better, sometimes not – from the many US imports which which were dumped in Australia, usually as ships’ ballast, during the war. Due to wartime paper restrictions, Johnson was forced to reduce the size of some offerings: Star Pocket Comics ran for at least 14 issues, successful in spite of some issues being printed on brown wrapping paper. The same paper shortage brought forth a decree that there would be no new regular runs of comic books. Johnson resorted to cunning to deal with the situation. His regular characters continued to appear each month but each issue bore a new title: King Comics, Amazing Comics, Gem Comics, Slick Comics, Bonzer Comics, Flash Comics and more. When imagination failed, the word “new” was tacked to an old title and the process began over again. Mercier’s work appeared in most of these issues. Mercier was a people watcher but the people he watched, ordinary everyday Australians, were transformed into creatures of his eccentric universe. Occasionally in the background of a cartoon someone would be walking around with springs on his or her feet, or on stilts or jumping around on pogo sticks. His characters’ feet quite often sagged at a ninety-degree angle half way along the sole of the foot. Dogs, cats and boozy types abounded. Mercier’s cast list was very Australian. I met Mercier just after the war, and I asked him for his definition of a good cartoon. 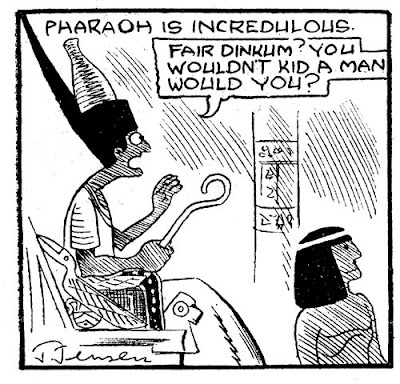 “A good cartoon, sonny, is one that is accepted, published and paid for,” he said. You might argue with this definition but for me it was heart-lightening. A few months after our meeting I took my first comic strip, “Mary Mixup, Female Spy Terrific” (by Jon J) to Frank Johnson Publications where, to my amazement it was accepted and published. My mother, who hated comics, wouldn’t have them in the house. When I took home my copy of Gem Comics No.27 with “Mary Mixup” within, Mum took it, tore it and threw it away. In spite of this, other titles followed, such as “Chester Nutte”, a time traveller, above, and “Snooper McDroople, Ace Newspaper Reporter”. 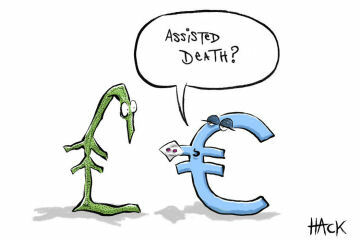 Mercier’s drawing never influenced me but a little of his humour rubbed off. The strips improved a bit over the twelve months I worked on them and there were strips for other comics publishers too, but “Mary Mixup” was an abomination. Johnson paid up – eventually. I think he was so traumatised by my demand that he continued to use my work, and pay for it … eventually. Bloghorn says click J for Jensen. One thing that all cartoonists are very aware of is that the face of publishing has changed. Much of it has been a little scary for established old-media cartoonists, but one of the undoubted benefits of the new trends has been on-demand printing. While there’s still a need for hard copy (books for fireside, on train, lining impressive bookshelves, in tent up mountain etc), self-publishing sites provide the bridge between the mature and the new by converting digital files into comforting, heart-warming, cuddly books to be held and cherished. An example, I hear you ask? Oh, if you insist. 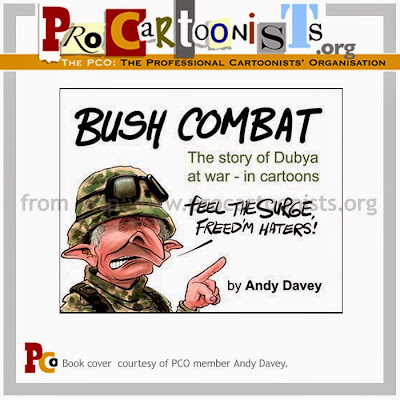 You could, for example, check out a short cartoon booklet called Bush Combat by UK cartoonist Andy Davey (see it here). 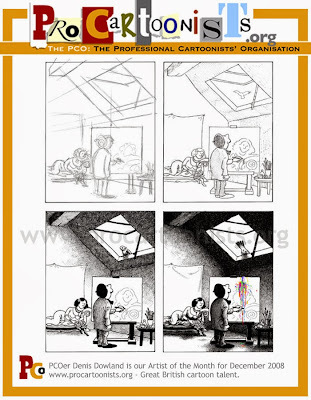 This was published, like fellow PCO cartoonist Ger Whyman’s book on the self-publishing site, Lulu. The book covers the pugilistic adventures of the boy George Dubya, from early spats with the UN, through the horrors of Iraq, right up to his search for a legacy in the Middle East. The time seemed right; it is meant as a last post to his disastrous tenure in the White house. The editorial cartoons all have brief explanations for those with medium-term memory loss; they were mostly published in The Guardian, The Times and The Independent over the last six years. Some are previously unpublished. It’s long on pictures and short on text, so even Dubya himself could order one and understand it … possibly. “I have had to learn to resist the Big Creative Rush, especially after a grand meal or closing time, when everything comes out so clear and sharp and you can do, of course, no wrong. “I have to let most ideas stew for some considerable time, we’re talking months here, mostly, before I commit them to paper, or nowadays the computer, lest I look at a page in total bafflement as to what on earth I may have had in mind the night before. I think something similar happens to Gary Larson on occasion. There will be more work from Denis next Friday.